Since the Gulf War, the Abrams tank has undergone a transformation, while fighting in conflicts across the world. Its M1A1 and M1A2 variants have seen great improvements made to this iconic tank, including in fire-control, armour protection, and thermal imaging technology. Involvement in the conflicts in Iraq and Afghanistan necessitated a number of upgrades and modifications as the United States fought two of its longest wars. Recent years have seen new variants of the series such as the ABV Assault Breacher Vehicle and M104 Wolverine Heavy Assault Bridge. Over the past few decades, the M1A1 Abrams has also been extensively exported and is license produced in Egypt. 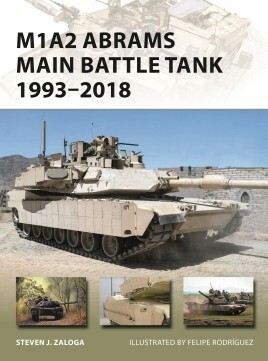 The long-awaited follow-up to NVG 2 M1 Abrams Main Battle Tank 1982-92 (1993), this fully illustrated study examines the Abrams tanks' last quarter-century of service with both the United States and its various foreign operators with a focus on its combat history. 48 pages. Tuote on lisätty luetteloomme tiistaina, 02. huhtikuuta, 2019.